Still in Water Village (Naam) from the previous session the party approached One-Armed Fiery Demon in the Inn of the Divine Scholar. There Zhi Zhu spoke with her. Because she is One-Armed Fiery Demon's informal disciple the two went outside to train where Zhi Zhu mentioned the Phoenix Crown of Bao. She learned that it was last seen at the Temple of Heiping. Before parting ways, One-Armed Fiery Demon asked Zhi Zhu to bring her the crown. After a discussion, the party decided to travel to Heiping Temple and see if they still had the crown. Long Shu and Kang Xi split from the group to investigate other matters near Chen. The rest of the party opted to take the river north to Rong-Yao, then take the road through the mountain pass and into Zun Valley. To do this they spoke with a tea merchant named Mr. Li who was willing to give them passage for 10 Taels. They talked him down to 5 in exchange for some minor services. Along the way, Rong climbed one of the masts and saw clusters of laborers through the trees in an area under threat from bandits. The merchant agreed to stop the boar so she could investigate. Going there she found a large Jade quarry being exploited by a local village. Because the quarry was between the areas controlled by Rong-Yao and The Heartless Bandits, she worried for their safety and the party talked the Merchant into leaving some guards behind to protect the people. He then said he would return to make a formal agreement that was mutually beneficial. In Rong-Yao, Xue Lingsu went to a Purple Cavern outpost and reported what he found. He was told to prevent the Phoenix Crown from falling into the hands of Lady White Blade. The outpost also sent Min, a junior disciple, to help Lingsu. Traveling along the road, the party eventually came to the Silk Tavern an inn fixed to a courtyard house with a walled gate. They went in and Lingsu ordered a very expensive dish called longevity duck. While eating three men (Proud Lion, Jade Crocodile and River Master Li) all clearly martial experts, came in one after the other (separated by about five minutes each), sitting down at nearby tables and looking at the party. Then Dancing Hawk came in and sat down to speak with Lingsu. Though LIngsu explained he did not approve of Madame Hamaya's death and had no direct role, Dancing Hawk was too angry, pounding his fists on the table and demanding revenge. Lingsu managed to convince him to take the fight outside. 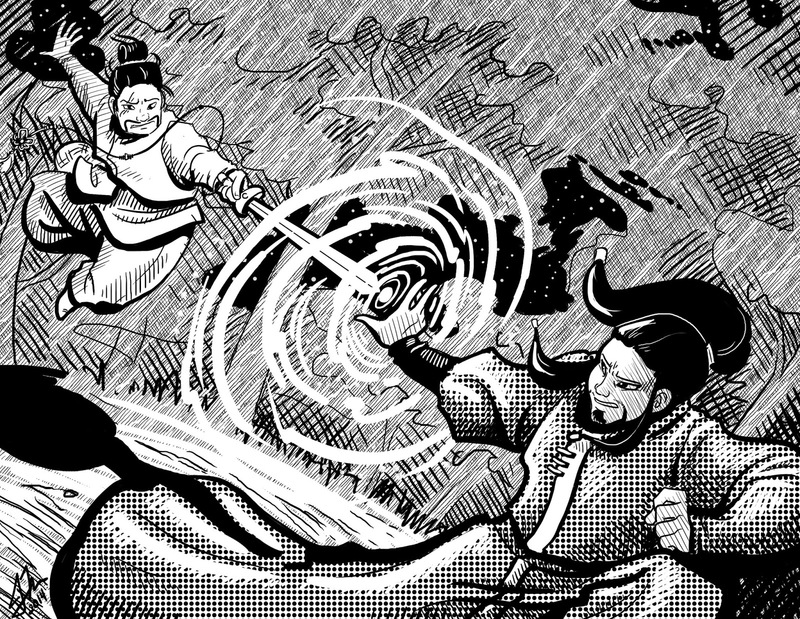 As he walked out of the tavern, Dancing Hawk was grabbed by Zhi Zhu's Arms of Silk technique and battle between the three other experts and the party commenced. It was not an easy fight, but eventually the party disabled the four men. When the dust cleared the proprietor offered to put the men in a room so they could recover and Lingsu agreed. The next day Lingsu went to speak with Dancing Hawk finding him drugged and finding Proud Lion was missing). He exchanged a few words and the party departed. They made good time, traveling several days and eventually reaching the Zun Forest. There they were ambushed by a Zun Tribesmen led by a Demon Master, but they quickly dispatched them. They then heard screams to the north east and decided to deviate from their course to investigate. Eventually they find a train of Zun Horseman dragging a male villager alongside them. The party ambushed the riders and saved the man, who informed them that the Zun were abducting male villagers to sacrifice to their snake goddess of the salt wells. He had been on his way to Heiping Temple to ask for their protection for the villagers. To get to Heiping Temple they had to scale the Falls of Sura and did so without incident. Once there, they met with Queen Luzhi, the head of Heiping, and learned that the Phoenix Crown was stolen from the temple by Nergui, an adviser to the leader of the Kushen. While in audience with Luzhi, a Heiping nun informed her that the party had been followed by a group. She informed them and they went to investigate who it was at the Gold Fin Inn. At the inn they found Little Venom with Chief Frowning Eagle and a group of men who looked like farmers. Little Venom offered Lingsu a cup of wine but he suspected it was poisoned so refused (in conversation he was able to confirm she had poisoned the wine). She claimed to be looking for One-Armed Fiery Demon but offered help with the Phoenix Crown and dealing with Lady White Blade. But because he knew she had been hired by Headmaster Mu before (who was in contact with Mystic Sword Sect), Lingsu was suspicious of her intent. He lied about their efforts and returned to Heiping where Queen Luzhi let them leave through a secret exit. Reviewing gazetteers they had bought in Rong-Yao, the party learned there was a recent semi-permanent camp of Kushen in the Northern Banyan, so they went to find it. Arriving there they spied on the camp and saw that both Nergui and Princess Sarnai were present. The camp seemed to be based near a deposit of turquoise, which the Kushen value and their guards were extracting. That night Zhi Zhu snuck into Princess Sarnai's yurt where she found a lacquered cabinet. Opening it, she narrowly evaded a slew of poisoned needles then saw the crown inside. Taking the crown she fled and joined the party.